Enjoy informal elegance onboard the yachts of Star Clipper Cruises in the Mediterranean. Friends gather round the Piano Bar and join in singing a few favourites. The bartender shakes a pitcher full of some delicious cooling concoction in the Tropical Bar. Clearly this is not a cruise ship in the ordinary sense. On Star Clippers, you will find that there are no rigid schedules. You are free to do as you wish with your days - and evenings. To entertain you, we bring local performers on board to give guests an authentic taste of the local music and arts. Relax and enjoy the conviviality of fellow shipmates while a live band plays tropical tunes from a real paradise. The Captain and crew are superb improvisers of the kind of light-hearted fun you'll only find on Star Clippers. The Captain's daily briefing on deck is wonderfully informative and a chance to hear some great story-telling as well. And there are other events and activities, such as knot tying and navigation classes, that have evolved from Star Clippers' sailing heritage. In fact, our passengers tell us that it's the easy-going informality of Star Clippers that makes a cruise with us so enjoyable. Star Clipper Cruises Wave Offer! Select Mediterranean Cruises Include 2 Free Hotel Nights! Climb the mast (with safety harness provided) to one of the passenger look-out 'crow's-nests', thoughtfully furnished with comfortable settee, where you'll have the grandest view of all! Royal Clipper's interior spaces are just as dazzling. They include a 3-deck atrium that funnels sunlight into the elegantly-appointed dining room, where you'll enjoy deliciously prepared cuisine and a no-tie dress code. A convenient marina platform lowers from the stern for water sports and diving. The ultimate unique Royal Clipper experience, the one-of-a-kind Captain Nemo Lounge, is the site of our spa and health club, which features underwater glass portholes! Combine the thrill and excitement of sailing on an authentic, majestic tall ship with all the amenities and comforts of a luxury cruise liner. Our ambition is to provide an exciting alternative to mass market cruising, while at the same time being in full harmony with the environment, the sea, the wind, the land and away from ports congested with tourists. Imagine gliding silently through the open seas under full sail, discovering out-of-the-way ports that few tourists can even get to. Anchor off a private secluded beach for an afternoon of sunbathing. You'll never feel confined. In fact, you'll find these ships offer more outdoor space per passenger than most conventional cruise ships. Snorkeling, SCUBA diving, banana boating, waterskiing, windsurfing are all part of the warm-water, small harbour package we are able to offer. 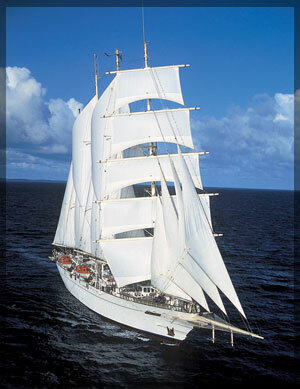 Star Clippers offers this and more. Our newest addition to the fleet, the Royal Clipper with 56,000 square feet of sail is truly a sight to behold. All of our ships are outfitted with state-of-the-art navigation systems and every comfort and luxury that once could wish for. Star Clippers creates a truly intimate setting, and a marvelous sailing experience that often costs less than one might pay for an average cabin on a typical tourist cruise ship. True clipper ships reflect their proud heritage in every inch; from polished brass to teak decks. Soft natural fabrics adorn the interior and pictures of famous sailing ships grace the walls. Beds are large doubles or twins, some of which can convert to doubles. The bathrooms are simply stunning, with marble accents galore. Other amenities include: a private safe, television with in-house video, hair dryers, and direct dial telephones. Like a fine resort, all the amenities for your room are prepared and waiting. Everything is immaculately maintained and your steward knows exactly when to appear or disappear. Traveling aboard Star Clippers is blissfully relaxing and gives you the feeling that you are sailing on a private yacht. Our ships also feature a welcoming indoor/outdoor Tropical Bar and their very own Piano Bar. Local entertainers and artists are brought on board as the ship sails from port to port. For your reading pleasure, each vessel has an Edwardian style library, complete with a warm glowing fireplace. The easy-going informality of Star Clippers' voyages is what passengers enjoy the most. The friendliness and enthusiasm of officers and crew, with their dedication to making guests content, is evident throughout. Our goal is to make your voyage not only an exhilarating experience but also a real sailing adventure. As a guest on one of our clipper ships, you will be treated to an array of culinary delights. Our inspired chefs go all out to ensure that your palate is richly satisfied with a choice of local and international foods, comparable to any fine restaurant. If the day includes a stop at one of the secluded islands we frequent, you might be treated to an outdoor barbecue, complete with all of the trimmings. On all three ships, you are free to dine when, and with whomever you wish, including Officers, who join us in the dining room, whenever they can. You'll find our service to be friendly and gracious, befitting a top quality restaurant and complemented by equally fine wines. The dress code? Casual elegance is the order of the day and every single night.